Israel Book Shop presents Chapter 18 of a new online serial novel, Divided Attention, by Esther Rapaport. Check back for a new chapter every Thursday or Friday. Click here for previous chapters. Rafi’s world was divided in two. The first part was in Kiryat Yovel, at home with Ima, and in class with Mrs. Davidi and the other children. There, he was Rafi who did what he wanted; the boy of whom everyone was afraid. No one dared say a word of rebuke to him. He was Rafi who was buddies with Ronny, and to whom Rina, the guidance counselor, tried to speak. But despite all these people in his life, he was really alone, so very alone, and he knew that no one was particularly pleased that he was there in the first place. Now, they were probably happy that he was gone, but soon enough, after they removed his cast and bandages, he would go back there and show them all. The other half of Rafi’s world was here, with Mr. and Mrs. Cohen and Nava. In their home, he was suddenly the youngest and everyone was worried about him and asking how he felt. They seemed to have his best interests at heart, or at least that’s what they said. He tried to be good, like they wanted him to be, and it wasn’t very hard. Only sometimes, they had to remind him that it was better to speak nicely, but except for that, they didn’t say anything. Even when he occasionally got up at night and made noise, they didn’t get angry or tell him that it was nighttime and that he had to sleep. Mr. Cohen would sit next to him and tell him a story, and sometimes, Mrs. Cohen would peel an orange or tangerine for him, or prepare for him some grapefruit segments sprinkled with sugar. The only problem was that he couldn’t always find his ball and that annoyed him, because sometimes, kicking the ball helped him sleep better afterwards. He thought that he liked the Cohen family, and maybe—he wasn’t sure—they liked him. It was really worth wearing the kippah for that; he was sure that they liked him even more because of it. They hadn’t bought him strings for his pants, nor had they taken him to the barber, even though he’d told them that he wanted this. Mr. Cohen had said they would “wait and see.” Rafi didn’t understand what exactly they were waiting for. Did they want to see how long his hair could grow? Rafi had wanted to go over to that kid and show him who he was starting up with, but his hands suddenly felt very heavy, reminding him that they were more or less useless right now. That worked out pretty well, because he was sure that Mr. Cohen would not have liked the idea of him starting up with other kids, even if they had really started up with him. On the way home, Mr. Cohen spoke to him about all sorts of interesting things, like the shul and praying and Hashem. If you live anywhere in the civilized frum world, you’ve heard of her. Etka Gitel Schwartz—the popular columnist in Binah Magazine and Hamodia. For years, this talented author has entertained thousands of readers with her well-written articles and serialized stories. 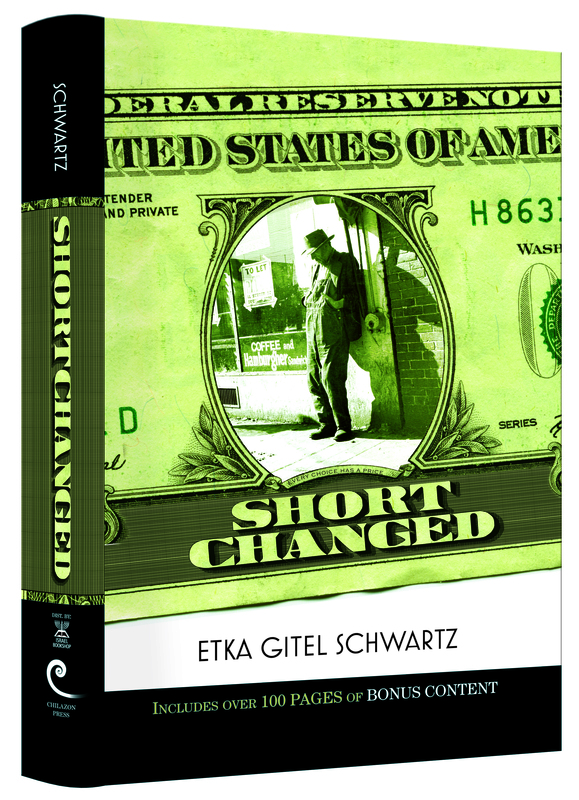 But, as any avid Binah reader can surely tell you, Etka Gitel’s first serialized novel, Shortchanged, was something different. When it began appearing in Binah Magazine, readers really sat up and took notice. Whether it was the fascinating plot, taking place during the Great Depression in America, or the true-to-life characters, or simply the amazingly well-written style of the author, it was this feature that Binah readers turned to first each week. And now, Shortchanged is being published in book form! Not only that, but in addition to the story, Etka GItel has added over 100 pages of bonus content—deleted scenes, previously published tie-in stories, behind-the-scenes features, historical photos, a timeline, and The Miller Memoirs: Rochelle’s Story! Read about the Rosen family, and the difficult decisions each family member must make. Feel what it was like to be a Jewish family living in America at this time. Open this book; you will enter the characters’ lives, and won’t be quick to leave them, either! We’re sure you’ll agree with us when we vouch that if there’s one novel you’ll want to get yourself this Sukkos, Shortchanged is that novel. The three cadets were to be interviewed at the Police Academy in Brooklyn, chosen among New York’s finest as potential candidates for the coveted Detective and Investigative Unit. It is rare that we are privileged to see “the whole picture” of something. When we do see it, we need to indelibly imprint that image upon our minds and hearts, so that it can resurface and strengthen us anew whenever we are faced with challenges and confusion. One of those auspicious moments is at Ne’ilah on Yom Kippur. As the holiest day ebbs away, we come face to face with the unmistakable truth that, “Hashem Hu Ha’Elokim—Hashem is G-d!” Seven times we recite those words, each time with more conviction and assuredness. Hashem Hu Ha’Elokim! All the pettiness of the world suddenly seems to us like just that—petty and insignificant. Hashem Hu Ha’Elokim! All the pent-up desires for the pleasures of Olam Hazeh, desires that have occupied our minds and our hearts for more hours than we care to admit, fade into oblivion, and are instead replaced with a yearning to cling to the Ribono Shel Olam. Hashem Hu Ha’Elokim! All the fantasizing about living the “good life” is defused by the realization that the greatest joy is the unraveling of doubts and the clarity of mission, purpose, and destination. Hashem Hu Ha’Elokim! How privileged and thrilled we are to be His servants, knowing as we do, with absolute conviction, that to be His servant is to have gained ourselves freedom. Hashem Hu Ha’Elokim! What an amazing feeling to be able to think on a spiritual level, without any earthly interference! Hashem Hu Ha’Elokim! The majesty of the Ribono Shel Olam is breathtaking; His kingdom is omnipresent. I am in awe of His greatness, which inspires and generates my love for Him. Hashem Hu Ha’Elokim! I see light. I feel pure. I have been privileged to a glimpse of the whole picture, for which I am eternally grateful. In this new collection of forty-five original and inspirational articles, Rabbi Yehoshua Kurland, noted rebbi and magid shiur of Yeshivah Shor Yoshuv, once again explores various topics in hashkafah in a most palatable and appealing way. 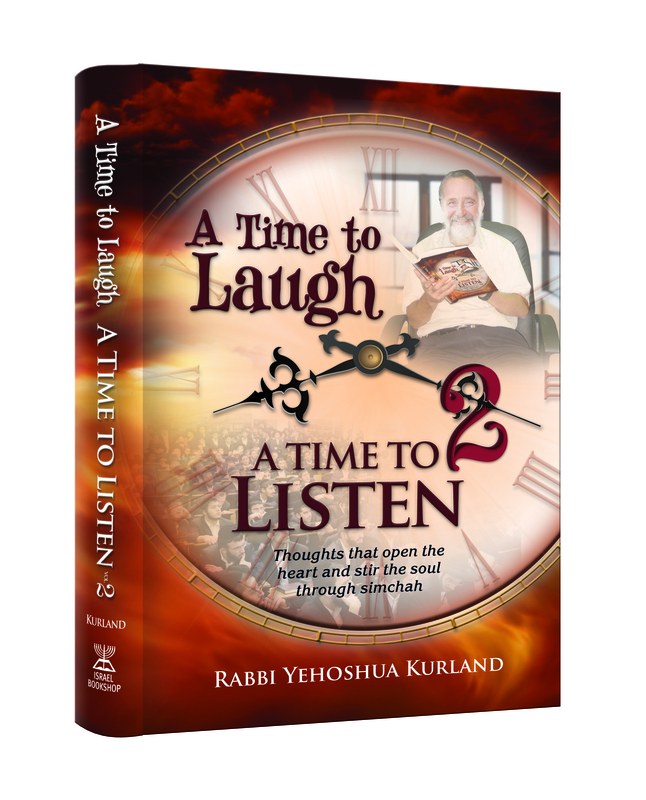 Tap into the richness and pleasure that this book has to offer, as it evokes within you the ability to laugh, and most importantly, the desire to listen. Just in time for Yom Tov and Parshas Bereishis! We like to think of Torah Tavlin as a menu that includes something for everyone—from satisfying divrei Torah and savory stories of our gedolim to the “spicy” quotes of famous Chassidishe masters, and everything in between. A delectable dish is comprised of a vast assortment of ingredients, and in much the same way, the secret to Torah Tavlin’s popularity seems to lie in its diverse variety of stories, parables, and divrei Torah on the parshah each week. Also, the fact that Torah Tavlin is neatly categorized according the days of the week ensures that you could learn something short and sweet on the parshah every single day! When Torah Tavlin Volume 1 made its grand debut, readers grabbed it, and then returned clamoring for more. Torah Tavlin on the Haggadah was our initial response to that demand, but now we’ve got even more for you—Torah Tavlin Volume 2! 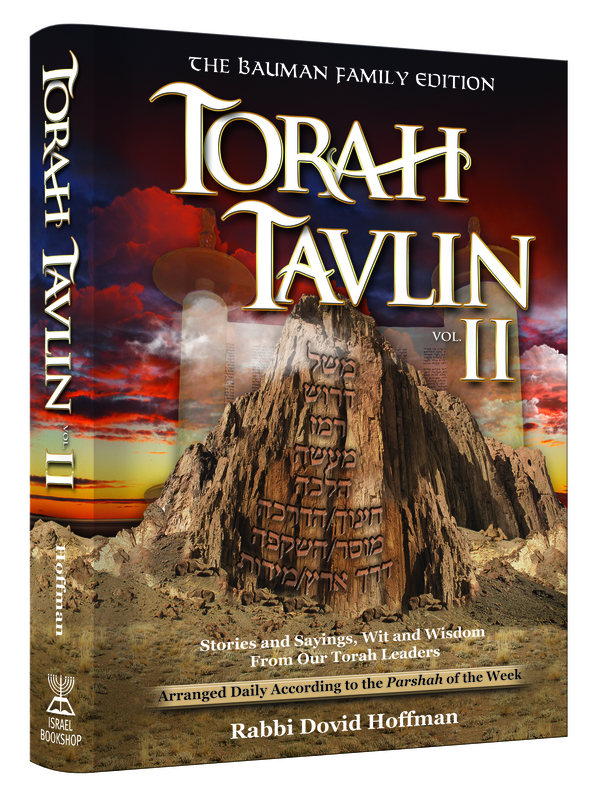 So get out there and pick up your own copy of Torah Tavlin Volume 2, before it sells out! With Parshas Bereishis right around the corner, you know, that may happen sooner than you think! 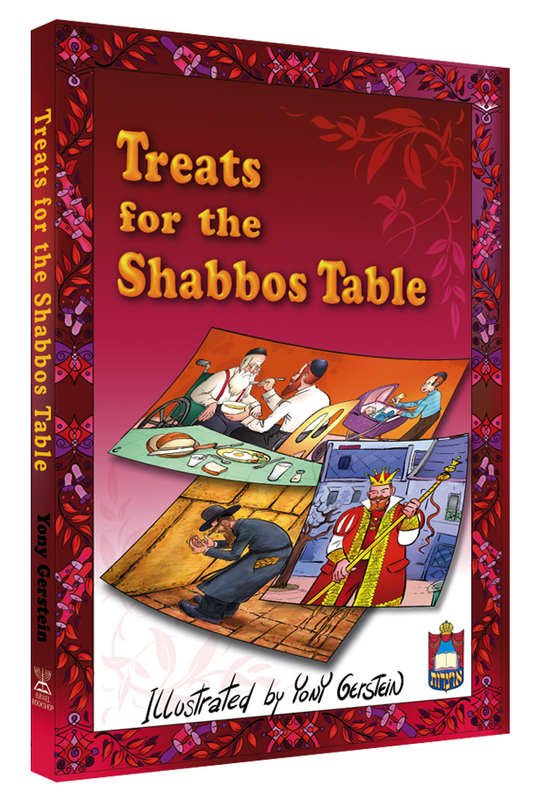 Click here for a free Rosh Hashanah Sample to add some “spice” to your Yom Tov table! Israel Book Shop presents Chapter 17 of a new online serial novel, Divided Attention, by Esther Rapaport. Check back for a new chapter every Thursday or Friday. Click here for previous chapters. Yael Cohen served her guests a plate of cookies and two cups of soda. “Which era interests you the most?” she asked in her soft, refined voice. If Yaeli would have to sum up Mrs. Cohen’s personality in one word, that was the word she would choose: refined. As much as she tried, she could not possibly imagine this woman not being religious. The truth was that Yaeli had not devoted even a second of thought to the matter before coming there. What difference did it make if they were writing about something that happened two hundred, five hundred, or even a thousand years ago? “Maybe the unification of Germany,” she blurted, just to say something. “Many years before?” Tikva echoed. The curtain hanging over the window of the small room fluttered in the wind. A quiet voiced called out, “Ima?” Someone was talking.